To help new immigrants adapt to a new lifestyle, our classes not only provided new immigrants classes in language skills, setting up residence and domicile, and regulations regarding household registration, but also provided cultural, employment, living safety and other diverse classes. Camp lasted from March 22 to May 12 (72-hour of class in total). A total of 17 students participated in Chinese class, including 8 Vietnamese, 5 Filipinos, 2 Thai, 1 Indonesian, and 1 Burmese. 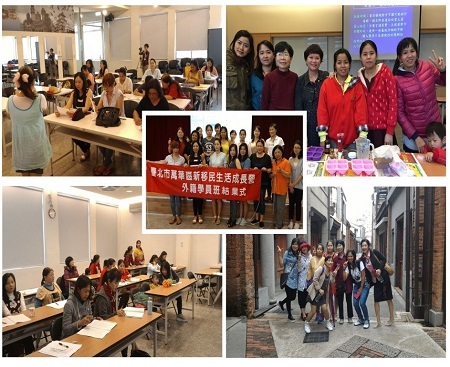 The nearly two-month classes will give you a tremendous memory and help you integrate into Taiwan's society and environment as soon as possible.